With the success of the Buick Encore it was as certain as night follows day that GM would create a knock-off version for Chevrolet. Perhaps the Chevy version should have been named the Sequel, not the Trax, because that’s what it is … a 2nd version of the Buick original. Of course the key to a good sequel is whether it is as good as or better than the original. Lets start by finding out how the Trax is different than the Encore. Is it cheaper? Of course it will be cheaper, it’s a Chevy. But what will Chevy do to it to make it cheaper? Will they remove everything that made the Encore a modest hit or will they take the basic platform and make the Trax something different and better? Mechanically the Encore and the Trax are virtually identical. Both feature the same 138-hp 1.4-liter engine. Both offer a plethora of high tech conveniences such as Bluetooth, OnStar services, smart-phone integration, a 7-inch touchscreen display, and a six-speaker sound system including a USB/iPod connection. I suspect the main difference between the two vehicles will be the amount of sound-deadening insulation and features like run-quiet tires which the Encore includes as standard. 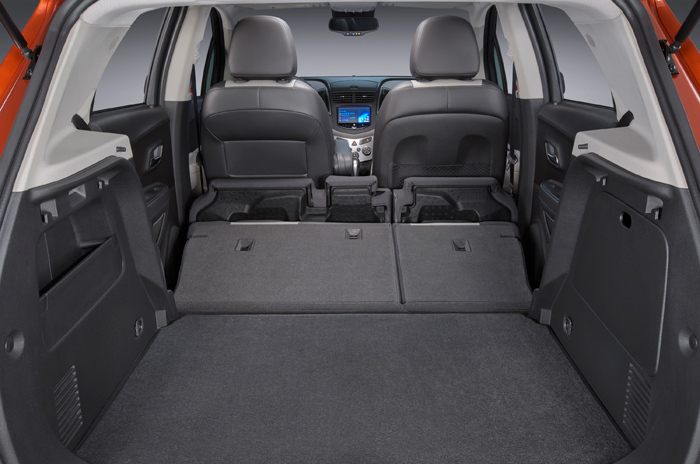 In addition, the Encore has as standard equipment like 18″ wheels, power drivers seat and a leather wrapped steering wheel; all of which will almost certainly be optional on the Trax. As is often the case with recent Chevys, the Trax, like the Sonic before it, has already been introduced overseas where it sold well; over 90,000 units in 60 countries since its launch in the late fall of 2012. Solid sales numbers overseas often translate to good numbers in the United States. Pricing information for the Trax hasn’t been released yet, but is expected to range from the low to mid twenties. Chevy forecasts the front-wheel drive version to get about 26 mpg in the city and 34 mpg on the highway. An all-wheel drive version of the Trax will also be available, I couldn’t find mileage information on it, but I would expect it to be a couple of miles per gallon lower both in the city and on the highway. If an all-wheel drive Trax averages 24 / 32 city / highway those would still be very good numbers for an all-wheel drive. 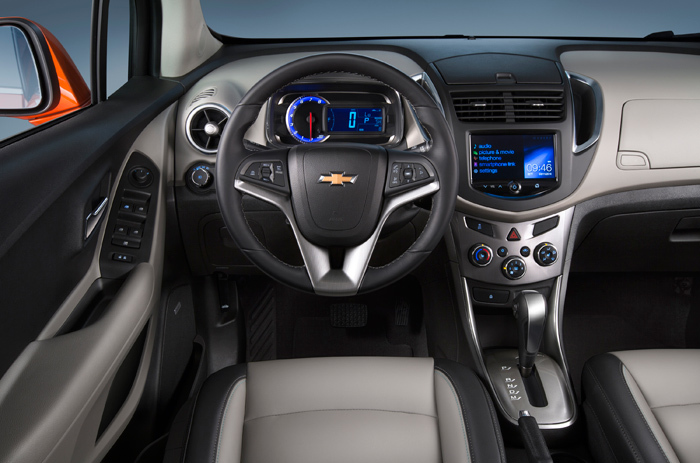 The Trax’s cockpit will look fairly similar to that of the Chevy Sonic, which maybe isn’t too surprising since they share the same platform. Like the Sonic, the Trax will feature a large, performance-style analog tachometer and a prominent digital display for the speedometer. A small-diameter, thick-rimmed steering wheel gives it a slightly more sporty look. The steering wheel will be leather-wrapped on LTZ and some LT models. As I understand it, SirI Eyes Free means you can display GPS information from your smart phone on the 7″ display which will negate the need for an expensive built-in navigation system. Standard remote keyless entry and available remote start. The interior features a surprising amount of space, which combined with a fold-down front passenger’s seat allows long, narrow objects (up to 8 feet in length) to be carried. 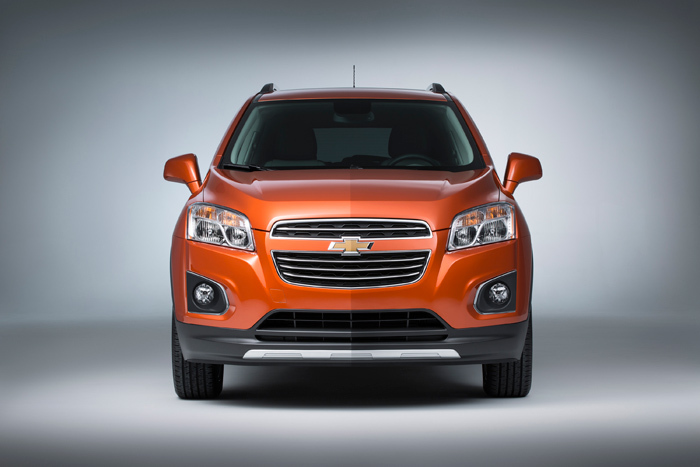 Like all the recently introduced Chevy’s the Trax features a dual-port front grille, the ubiquitous bowtie emblem and swept back headlamps. Trax will be offered in LS, LT and LTZ trims. Exact pricing has yet to be announced. Some of the obvious competitors to the Trax are the Kia Sportage, Subaru CrossTrek, the upcoming Honda HR-V, and, of course, the more upscale Buick Encore. According to Kelley Blue Book senior analyst Karl Brauer “The small CUV’s combination of style, fuel efficiency and flexibility will lead to increased consumer demand over the next several years.” I couldn’t agree more. With the expectation that gas prices will continue to increase I don’t see how it could be otherwise. The Chevy Trax will no doubt be worthy of consideration but whether it is a worthy sequel to the Buick Encore remains to be seen. My guess is it will be better than Matrix 2, but no Wrath of Khan.